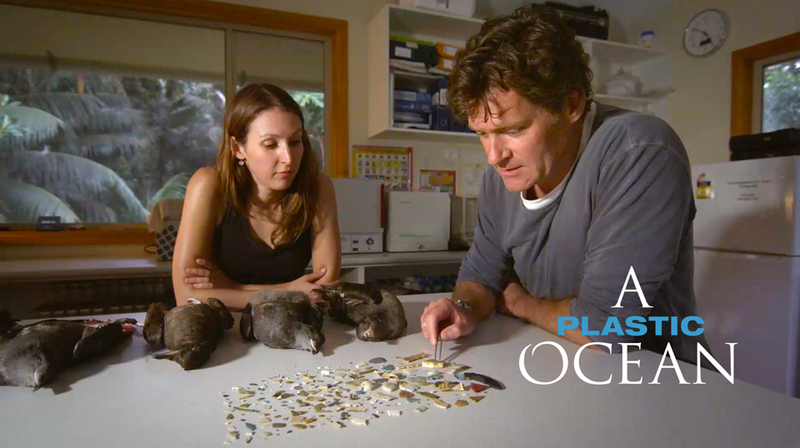 We are pleased to offer this brief interview with Craig Leeson, director of our award-winning documentary A Plastic Ocean. Craig is a fourth generation media professional, having worked in print, radio, television and film. He has produced award-winning results for such media outlets as CNN, National Geographic Channel and the BBC. He plays in a rock and roll band, surfs the waves of the world and is self-professed addict of macadamia nuts. In the film, you apologize to the Pygmy Blue Whale for human behavior, and you’re angry about the plastic ocean situation. Why? I grew up around an ocean environment and it molded the way I think about the environment in general, as well as how I interact with other species. I realized from an early age that everything on planet earth is interlocked and none of us: humans, dogs, fish, whales – can survive without the other. (Although I tend to think the earth would probably do a lot better without the human species.) Each ecosystem is a finely balanced instrument. Once we upset that, we create problems for our own species, because we rely on other systems to live. This isn’t some tree-hugger philosophy. This is how our planet actually works. So when Jo called me and said “There’s a serious problem with plastic in the ocean,” I knew a tiny bit about it but when she sent some of her scientific evidence, I realized I didn’t – not by a long shot. Then I went out myself in the oceans I was near with the travel and work I was doing at the time. I looked into the wind lines on the beach, the grains of sand, the high tide mark, and I saw what she had seen in the North Pacific gyre. This made me rather angry with myself because I couldn’t believe I had missed this; that I had allowed myself to be conned by the marketing claim that plastic is disposable. Once I realized that if something like this could get past me – and I’m someone who is in tune with the ocean – then it’s clearly getting past the average person, particularly people who don’t live near an ocean or have a relationship with it. That was the catalyst for my jumping on board with Jo and saying “We really need to throw everything we’ve got at this,” because at that time there was very little science available and we had so many questions. We instinctively knew that if the plastic problem was happening in the North Pacific gyre, it was also happening in the South Pacific and the Atlantic gyres. But we had to prove it. As it turned out our investigation showed that the problem was actually far worse than we imagined. So, my initial anger was not destructive, it was constructive because it made me determined to help get the film done and out to the public. The scene in the film where the scientist demonstrates that ‘plastic breaks up’ gave me chills. Tell us about that. “Plastic breaks up” is a very powerful term. In fact because of that interview and that scene, it changed completely how we thought about plastic and how we expressed it. The term “breaking up” instead of “breaking down” is something that has such a different connotation. That became a standard term that we forced everyone to use describing plastics because when we as consumers tend to think of things breaking down, we think it decomposes, which is part of the way we have been taught about that phrase. “Breaking up” has a completely different connotation because when something breaks up we get a mind-picture that it breaks into different pieces. And that is exactly what happens to plastic. So we don’t get the idea that it goes away. You describe A Plastic Ocean as an Adventure-Documentary. Why is that? The film is not a dry science lesson. This is the true story of a group of scientific adventurers on a quest. Through images and dialogue we take people on the journey with us – to enjoy, if you will, the many locations we go to, hear our stories, and see what we we’re learning. We want viewers to be with us as we discover new information, and film pygmy blue whales underwater for the first time, and see an albatross regurgitate plastic its mother has just fed it. We want them to experience the sense of shock and horror we felt. It’s all very genuine and in the moment. A Plastic Ocean is an expedition for us and an adventure – and we wanted it to also be that for the viewer. How did it feel to sit on that massive plastic trash pile? Walking on it felt like walking on a boggy marshland as my feet would sink up to my ankles with each step. But when I sat on it – and really I was sitting in it – the immensity of the sheer volume of plastic underneath me gave me a sense of desperation. I think a lot of people are feeling this type of desperation in places we filmed like Tuvalu and Fiji and Manila. When you look at the beaches of Manila, you get the same sense of desperation, because all you can see is plastic for as far as you can see, up and down the beach and people are walking, living on this every day. In Tuvalu, they can’t bury their plastic, because the atoll is made of coral and too hard to dig. So there’s no where to dispose of the plastic. It just builds up and up and up. This is a microcosm of what is happening all over Earth. We can’t leave this planet yet, and we also can’t get rid of the waste we’re discarding; like Tuvalu, it’s just building up around us and we are slowing starting to sink in it. What do you want people to take away so they don’t feel like they can’t do anything? It is very important that people not leave the theater feeling we’re all doomed. At an earlier stage, I was completely pessimistic about the future of the planet. That’s why it was extremely important to get someone like Tanya involved. She has children (I don’t) and as a mother she demands bold solutions to big environmental problems – for our youngest generation now and those that follow. In the solutions section, it was important to show technical advancements like Pyrogenesis, which can take the waste and turn it into an inert non-toxic substance and release it back into the environment. But I didn’t want to fill the technology section of the film with that sort of thing because I don’t want people thinking that this is something that other people will solve for them. Each of us is connected to the plastic we use and we’re all responsible for what and how we use it. The biggest message of this film is that everyone, everywhere, was sold a dishonest marketing concept: that we could use plastic, throw it away and it would be gone forever. And what we want everyone to understand is that there is no “away.” Plastic is the most durable material man has ever made and every piece ever produced is still on the planet in some shape or form. Given that we are producing more than 300 million tonnes a year, you can see how that is building up in to a problem that is going to affect our planet, other species and the health of each one of us. If you take plastic water bottles as an obvious example, one of the major problems is that people are using plastic water bottles thinking they are doing themselves a favor, when they are actually damaging their own health. The irony of this is that the water in most of these bottles sold to people is not as good as their own tap water. In fact, a great deal of it comes from their municipal tap system and is bottled by large corporations. And it is done so without taking out the bacteria, the fluoridation or the chlorination. Our argument is – and this was proven in the film by some of the chemistry laboratories – as soon as water or food come into contact with many of these plastics, then they start to leech into the food or liquid they are in contact with. So it is not just that you’ve been sold water at a thousand times what you could get it for free, but you’re also doing yourself harm because these plastics are leeching chemicals into your body. I’m not anti-plastic, I’m anti plastic in the environment. If we manufacture it and use it we must learn how to deal with it properly before it gets in to the environment and starts to wreak havoc. One of our most powerful parts of the film I think, is the fact that 92% of Americans have plastic and chemicals from plastic production in their system and their children have twice as much. That is one point I want people to take home with them. If they look around that cinema, and realize that they are probably not the lucky one; and if it causes them to look at the plastic container they’re drinking their soda out of with the plastic straw and plastic lid or the plastic container they have their popcorn in, it may cause them to think about that in a very profound way as they walk out. And if they do think about that and the future of their children then I think we’ve achieved our aim.